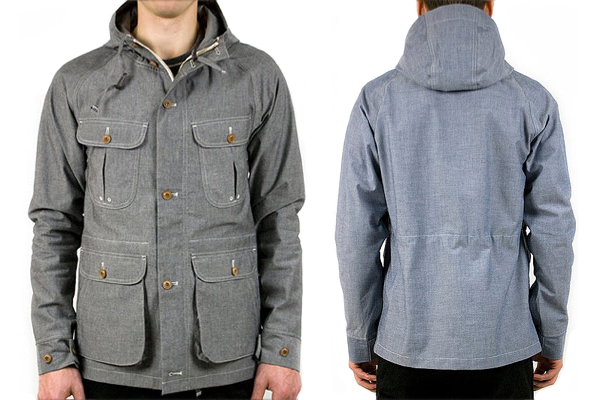 For Spring 2010 Canadian label Wings + Horns have released a Waterproof Chambray Mountain Parka. The M65 styled Chambray Mountain Parka is constructed of 100% Dintex waterproof cotton parka with raglan sleeves, adjustable cinch hood and waist with leather toggles, six exterior front pockets (two pleated chest pockets and four double layer flap/slant pockets below), and dual button and two-way Ideal zip front closure. It is available in your choice of black or indigo chambray and retails for $600 USD. The coat is available in a full size run at Blackbird now.